'Boring' Singapore City Photo: F1: Night view of the skies..
Not sure if you can see the difference in the photo below. That's the F1 circuit! Bright lights will lit up the roads where the track is. The wonders of technology and modern lighting system. The last few days, road closures have started. Many people are not able to drive to work. People are taking public transport and walking. Momo is one of them. The various "No Car Day", "World Car Free Day" campaigns never worked here. Guess what? This week seems to be a forced "leave your car at home" week for many. Only F1 cars allowed. haha..
Wow the roads looked very bright. Nice view from where you are. Beautiful. Are you going to the race? I am avoiding that area, it would be real congested. wow, I thought you did something to the photo!!! Nice! Should be a great view and much fun as well. Do you plan to attend? Very nice pic there. It really looks fantastic from aerial view. Great view of your city! It is an amazing and intriguing glow indeed. Those highways are floating and they almost look like elastic. Very cool pic!! 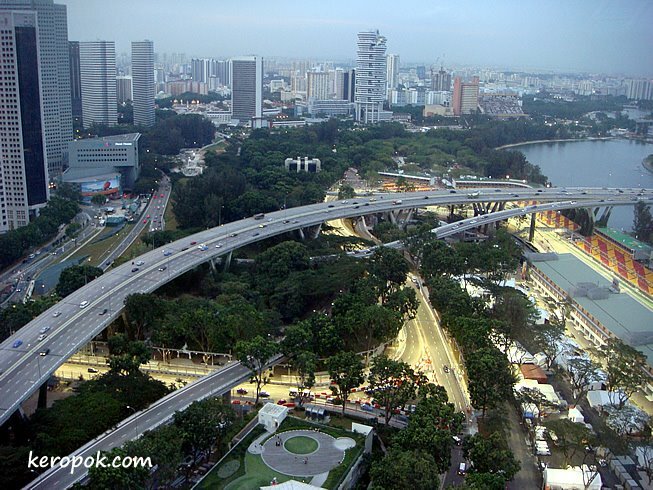 Took it from the Singapore Flyer last week.